JL10 Series | Japan Aviation Electronics Industry, Ltd. The JL10 Series are TÜV approved and UL recognized, one-touch locking, circular, waterproof connectors for industrial machinery, satisfying European safety standards. The adopted one-touch lock mechanism has a superior mating and unmating operability and the product contributes to mating function ease. The JL10 receptacle offers a hybrid one-touch lock and threaded dual function mating. 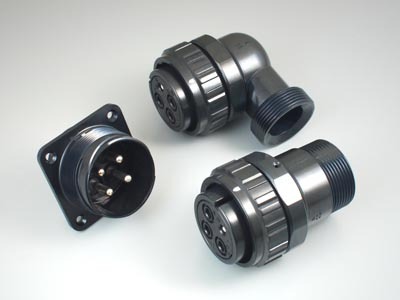 The connector offers mating compatibility with conventional MIL standard MS connectors and with our screw mating plugs (JL04V, N/MS, and JA). On top of the existing solder termination, a crimp termination option has been added to the 18-10 and 22-22 pin arrangement receptacles. Adopts a one-touch bayonet lock style mating allows secure mating even in narrow operating spaces or areas with poor visibility. Contact Size #16: 13 A max., Contact Size #12: 23 A max., Contact Size #8: 46 A max., Contact Size #4: 80 A max.